Father Christmas looks to be giving Rudolph and his reindeer pals a night off this year after upgrading his sleigh. 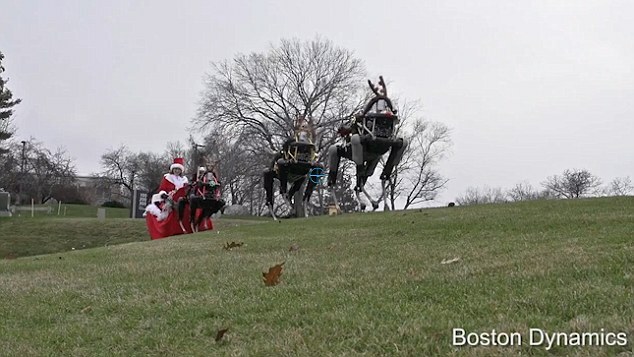 American engineering firm Boston Dynamics has created a group of robot reindeer that are capable of dragging Santa's sled, as revealed in its Christmas message. The firm, which develops technology for the US military, posted the festive video on YouTube, featuring a female member of staff dressed as Mrs Claus driving the automated animals. She bids everyone a 'Happy Holidays from Boston Dynamics' as Jingle Bells plays in the background and the black robots trot along a grassy hill. They could be mistaken for mechanical versions of any four-legged animal, if not for the fluffy antlers on their heads. Boston Dynamics rose to fame after developing the BigDog in 2005, which serves as a robotic pack horse for soldiers and can carry 340lbs (150kg) alongside a soldier moving at 4mph. It has gone on to develop a series of robots, including the Cheetah, that can gallop at 28mph, and the Atlas, a 6ft humanoid robot that was designed for search and rescue tasks. The firm is owned by Google and was initially created at the Massachusetts Institute of Technology in 1992 before it was spun off by company president Marc Raibert.